So I’m Jewish. I used to not be Jewish, and was indeed a Christian. My husband and I are not Orthodox by any means, but live fairly Jew-ish (ha) lives. I sometimes miss the festive qualities of “the holiday season” (AKA Christmas decorations) and our fireplace was looking rather drab and sparse, so I put up a wreath similar to the one in the picture. My husband was with me when I bought it. He didn’t seem super into it, but said he’d tolerate it to make me happy. The problem is, since we got it home and put it up, he’s been calling it the f-ing wreath (not saying f-ing, but the whole word, but since I’m weird about swearing I say f-ing) and complaining about it to no end. He says that wreaths are for Christians, and last night (about three days after wreath implementation day), he said that he was afraid I’d be making him go to church soon. Have I done something wrong here? I just wanted some festive greenery. 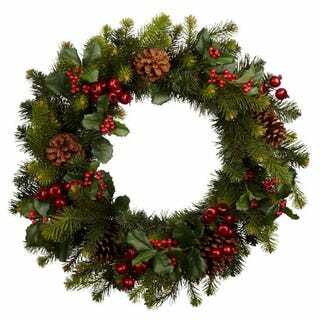 Are wreaths just for Christians? What are all the cool kids wearing this Fall?